To help commemorate its 40th anniversary, Synergetics is pleased to release the second in a series of quarterly industry updates – Food & Beverage Industry. Synergetics considers Food & Beverage a core business line and is well versed with the numerous trends affecting the industry. Also included is a linked article that further details particular challenges in the industry as they relate to Co-Packaging/ Co-Manufacturing operations. 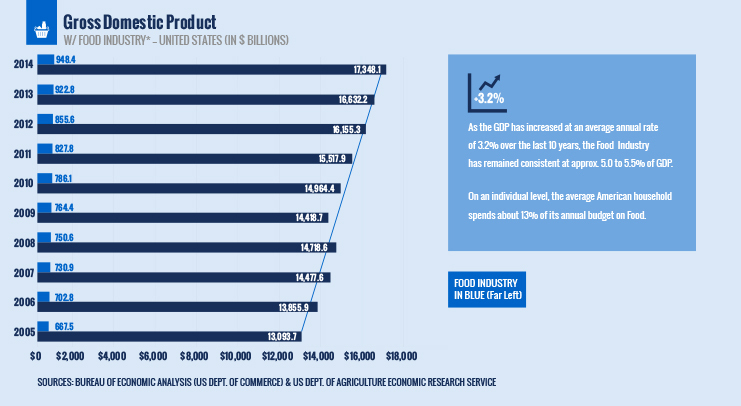 The Food & Beverage Industry, not unlike several other business sectors that help drive the US economy, is complex and trend-driven, with many areas that can determine the industry’s overall financial impact. 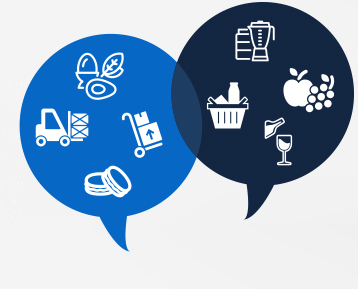 From farming and agricultural related businesses to packaging/processing food products, and to their distribution and sale, each area plays a prominent role. All interact to affect the sensitive price balance that the market demands from producer to consumer, challenging already thin margins. Synergetics has a long successful track record of partnering with Food and Beverage organizations in financially challenging conditions, realizing there are many key cost drivers throughout the production cycle and distribution process. Included in our toolbox is the ability to identify, measure and address associated critical pressure points no matter how complex. Effective Contract Manufacturing and Packaging companies need to maintain pricing competitiveness and service level excellence to be competitive in the food industry. Truly effective vendors work with their customers to leverage opportunities within the supply chain. A competitive advantage of this market segment is that it is recognized as having high growth potential because it targets specific consumer needs, and those are usually directed toward healthy ingredients. Synergetics has become involved with several relatively new companies in the healthy food category, all of which are experiencing high growth. 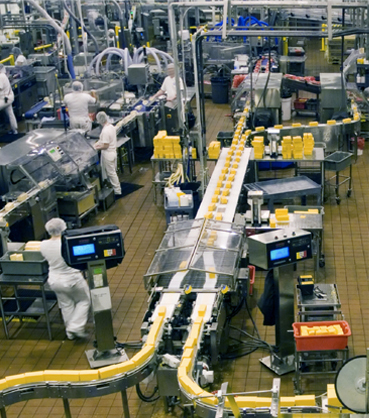 A common opportunity in the Food Industry is the lack of an effective Maintenance Program. We see the basics being missed time and time again, such as: equipment not maintained resulting in frequent operational meltdowns; departments maxing out on two shifts and not allowing time for necessary PM; or not considering/planning for required sanitation windows. Maintenance operations are one of Synergetics’ first assessment areas when we look at food-based businesses. We have a proven track record of working effectively with production planning, production, maintenance and sanitation to schedule machine availability while developing and implementing Maintenance best practices. Within the Food Industry, one may hear the terms Co-Manufacturing and Co-Packaging – but exactly what are they and what role do they play? These terms are often used interchangeably, but there is actually a slight difference between the two. The prefix “Co” refers to “Contract” and invariably points to third party involvement. The use of a third party to manufacture or package a product is an increasingly common strategy for food companies to reduce assets, speed time of product to market, and ultimately reduce costs. The Co-Manufacturer makes the hiring company’s product per their specifications and ingredients, as if it were actually made by that company. Co-Packaging is used when the producing company doesn’t have the packing capacity, machinery, knowledge, etc. to make products shelf-ready. The primary driver for outsourcing is managing costs because third party operators already have the expertise, resources, and staff in place to complete the process efficiently. What differentiates an effective Co-Manufacturing / Co-Packing company from others? What are some examples of working with customers that optimize the supply chain between a company such as Sterling and its key customers? Synergetics has supported me on several acquisitions and many turnaround situations in the food industry including bakeries, meat processing and fresh prepared salads. They have always proven to be effective and collaborative with the company’s organization. What sets Synergetics apart is their ability to effectively implement through the management team, and their commitment to an ROI-based value proposition truly differentiates them. *Within Synergetics' portfolio of business clients, the Food & Beverage Industry comprises close to 25% of our actual client list. companies have called upon us multiple times for major implementations across a wide range of brand names under one umbrella.